When I learned of Emna Zghal’s latest solo exhibition at Miyako Yoshinaga art prospects, I excitedly leapt at the opportunity to review her work. Zghal hails from Tunisia, the birthplace of 2011’s Arab Spring. What an opportunity to see how such mesmerizing political events would be reflected in art! I assumed Zghal’s art would drip with revolutionary fervor. Rather than an infusion of political and revolutionary drama, Plato/Pineapple - a collection of clean, bright prints and drawings - is a meditation on the beautiful simplicity of nature. But don’t let “meditation” fool you into thinking this is a sleepy collection. Zghal’s exhibition is anything but subdued—the intense colors (many citrusy) in Plato/Pineapple are so vibrant, one can almost taste the tang of the pineapple at the center of her work. As much as she is moved by the politics of the Arab Spring, Zghal does not necessarily have to be political, she explained. She is wary of playing to a Muslim or Tunisian or female (or whatever) identity: “I am not interested in being reductive,” Zghal affirmed. In Plato/Pineapple, the causal action of nature is revealed to be sublime. Take a closer look, though, as the artist does with detailed magnifications of cross-cuts of the fruit, and marvel at a world of intricate threading and, occasionally, whimsical diversions from the repetition better seen from afar. From up close or at a distance, Zghal’s pineapple-inspired art is simultaneously recognizable and pleasingly abstract. The common motifs of the exhibition are pattern and repetition, as revealed by horizontal and vertical paper-thin pineapple slices, as well as its barbed skin. To re-imagine patterns that, essentially, repeat ad infinitum - that is, to make this repetition interesting, Zghal employs a multitude of techniques. 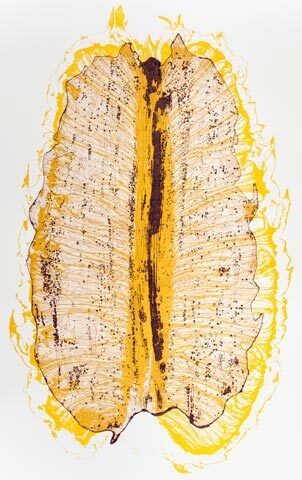 At times, the artist zooms in to show microscopic details of the fruit’s fibers, and then explodes the image into outsized abstractions. Just as often, though, Zghal pulls back to display the pineapple so we might recognize its skin or a rounded chunk. Through processes of digital tracing, transfers, etchings and silkscreens, and then, finally, an application of vivid hues, bland repetition becomes punctuated, interrupted, imaginative. Suddenly, as in “Brown Sun,” a simple pineapple slice appears to be the sun trying to shine through a sepia sky. That same slice, however, takes on eerie definition in “Ananas Island,” a photo negative representation that resembles an empty, volcanic island, as seen from above, lost in a sea of inky waters. A summer-hued, lengthwise rendition of the pineapple vibrates with high voltage in “Electronic Pineapple,” while “Pineapple Sun,” a large silkscreen and etching with a dramatic golden corona, is full-to-bursting with energy. “Pineapple I” presents a close-up, biological vantage on the pineapple slice. 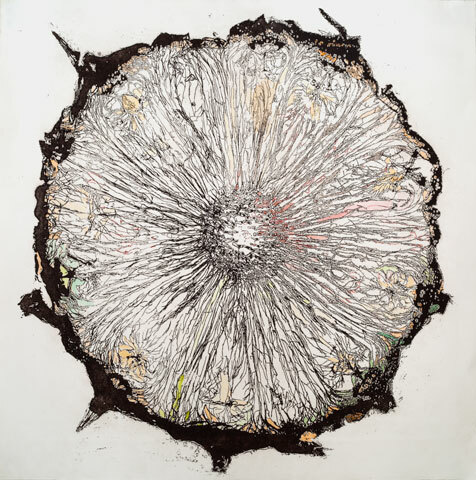 One of the larger pieces in the show, the buff-colored pineapple slice contains what looks like a nucleus (the center of the slice) in an amniotic sea populated with strands of chromosomes and other miniscule, organic matter. The image is reminiscent of Kandinsky’s late work when he dabbled in the same biological minutiae. In Plato/Pineapple, the outside of the pineapple gets just as much attention as its innards. In “Pineapple Scribble,” loose traces of the fruit’s outer skin recall a thick flock of doves or gulls taking to a blue sky. In “Red Spikes,” however, the work is grounded: one is reminded of (and saddened by) a clear cut forest, though whether you see a field of tree stumps or resilient saplings is likely determined by your mood that day. 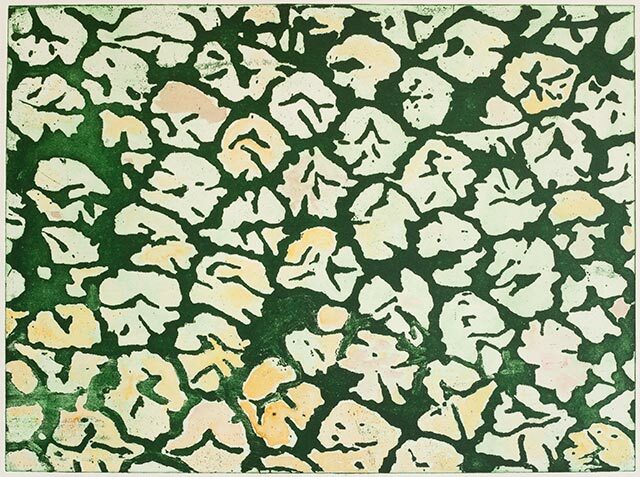 “Green Tiles II” is more uplifting—indeed, striking: the repetitive skin cells interspersed with streams of bold, hunter green are mesmerizing; the piece is reminiscent of the natural imagery of eastern Asian art. In short, Zghal’s compositions—be it a singular sunburst or a geometric carpet - are simple, but lively. They are also “poetry for the eye,” a descriptor Zghal invokes as a reason for coming to painting (she trained in woodcuts). Her visual poetry directly addresses the “Plato” in the show’s title, for it was the philosopher who banned the poet from his ideal city: “He and his kind have no place in our city,” he professed, “their presence is forbidden by our code.” Zghal’s grievances with Plato’s damning exclusion, as well as her ideas on art and subversion, can be found in the exhibition’s accompanying book, Plato Pineapple Poetry Painting. Plato/Pineapple does not easily conform to any political, philosophical, or academic identity - believe me, I tried. The best I could offer Zghal was that some of the circular works in the show (e.g., “Pineapple Sun” or “Pineapple Web”) reflect the patterns ubiquitous in Islamic art and culture. She conceded the possibility, admitting that Islamic culture has measures of influence on her art, her thinking, her living. Yet the ascription of Islam onto her prints seems gratuitous. To force a political or theoretical underpinning onto Plato/Pineapple is folly. Rather, one must simply enjoy the collection for what it is: poetry for the eye.